Unlike French meringue, which results in hard cookies, this recipe calls for a Swiss meringue, which is soft, light and fluffy. 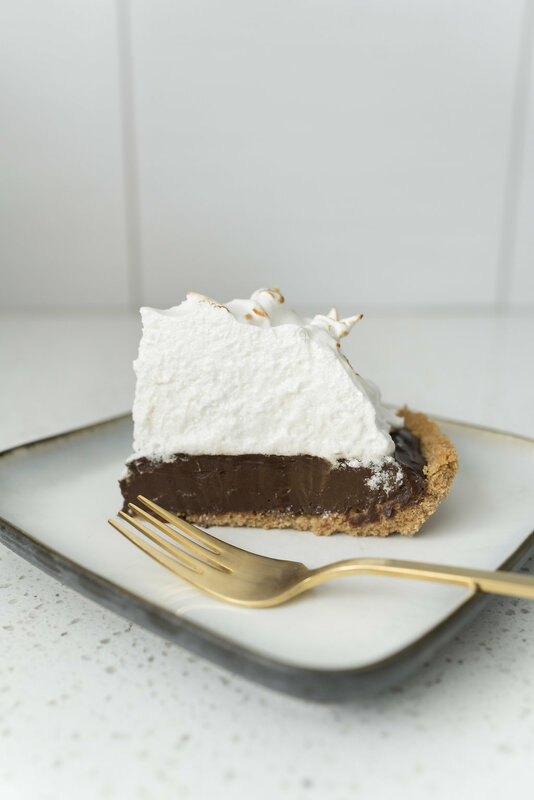 It’s the perfect compliment to the rich chocolate filling, without it the pie would be far to decadent. 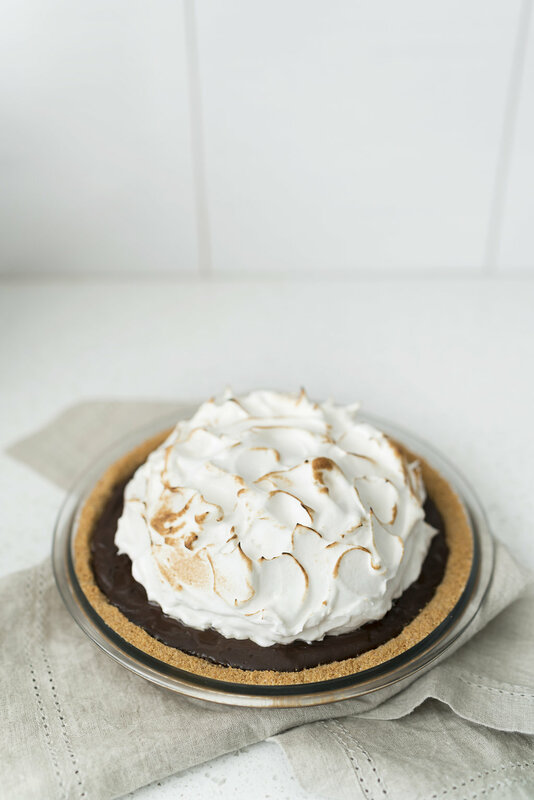 The meringue cuts the richness and sweetness perfectly. 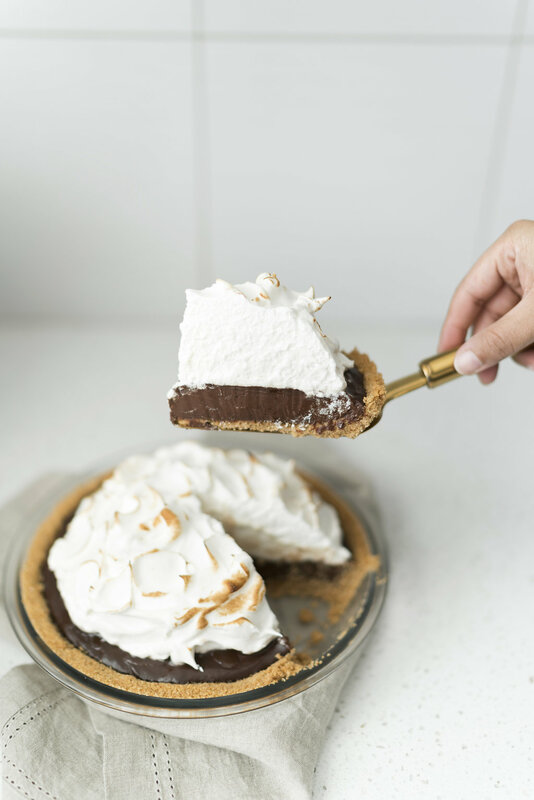 The key when using a Swiss meringue is to ensure your pie has come to nearly room temperature before topping with meringue. 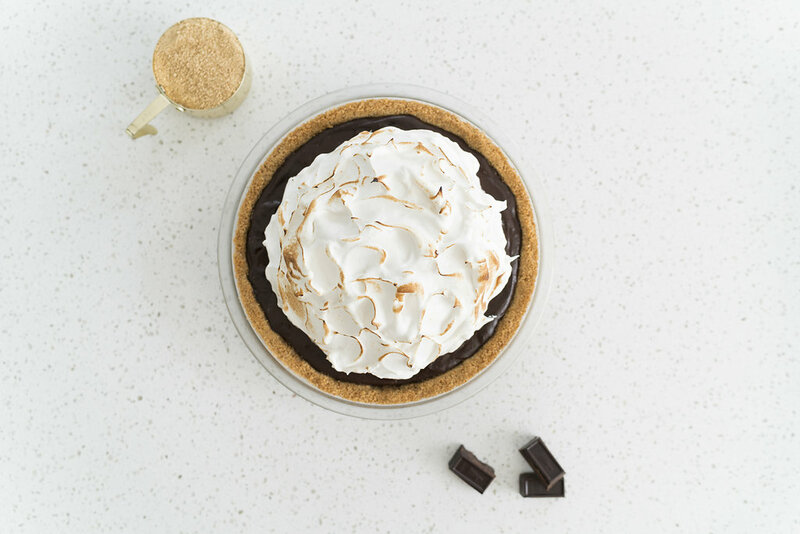 Adding meringue to a cold pie will cause the meringue to weep. While still tasty, it’s not exactly visually pleasing! In a small bowl, mix the the graham cracker crumbs, brown sugar, butter and pinch of salt until the texture resembles wet sand. Gently press the crust mixture evenly into the bottom and up the sides of a 9 inch pie dish. Bake until the crust is lightly browned, about 10 minutes. Transfer to a wire rack and let cool completely. Meanwhile, in a saucepan over medium heat, warm the milk until small bubbles form around the edge of the pan. Remove from the heat. In a bowl, whisk together the egg yolks, 3/4 cup of the granulated sugar and a pinch of salt until smooth. Sift the flour and cocoa powder over the yolk mixture and whisk until smooth. While whisking constantly, slowly pour in the hot milk, then pour the mixture into the pan. Set over medium heat and cook, stirring constantly with a wooden spoon, until the mixture comes to a boil and thickens, about 4 minutes. Reduce the heat to low and cook, stirring constantly, until the mixture coats the back of the spoon, about 1 minute more. Pour the filling through a fine-mesh sieve into a bowl. Add the chocolates and stir until melted, then stir in 1 tsp of the vanilla and 1 tbsp of coffee. Spoon the filling into the cooled crust. Refrigerate, uncovered, until chilled, about 2 hours. When the filling is chilled, in a saucepan, bring 1 inch of water to a simmer. Place the egg whites and the remaining 1 cup granulated sugar in an electric mixer bowl and set over but not touching the simmering water. Whisk until the sugar is dissolved and the mixture is hot to the touch, about 2 minutes. Place the bowl on the mixer and add the remaining 1 tsp vanilla. Beat with the whisk attachment on high speed until the meringue cools to room temperature and stiff peaks form, 5 to 6 minutes. Mound the meringue on top of the pie, using an offset spatula to spread it to the edges. Using a spoon, create mountains of meringue on the surface. Lightly brown with a kitchen torch. Serve immediately, or refrigerate for up to 6 hours. Serves 8 to 12.